Conditions are rules that are applied to individual questions or message items or to entire survey pages that determine when those items or pages should be shown. Conditions can be based on answers to previous questions, user profile properties, or response properties such as the current date or survey score. For example, if a respondent gives you a poor satisfaction rating in question #1, you might want to have a follow-up question #2 that asks the reasons for their dissatisfaction. In this example, you could add a condition to question #2 so that it will only appear if the respondent gives you a 1 or 2 out of 5. You can add one or multiple conditions to an item or page. If you have multiple conditions, you can set them as ‘And’, ‘Or’, or nested ‘And/Or’ conditions. Branching or skip-logic is another type of survey logic that allows respondents to skip over pages of a survey or even all the way to the end of the survey. When adding a branch, you have to specify two things – where you want the respondent to branch to (e.g. page 6) and under what conditions you want the respondent to be branched there. For example, you might want to add some qualification questions on page 1 that, if not answered a certain way, would cause the respondent to exit the survey. To do this, you would add a branch from page 1 to the Completion Page of the survey. That branch would have conditions based on the answers to page one’s questions. 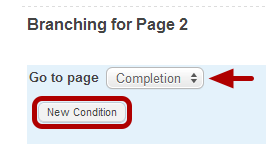 This guide will walk you through adding simple page conditions, item conditions, and branches. To add conditions to a survey item, click on the ‘Conditions’ tab in the survey editor. In this example, we will be creating a condition using the ‘Basic View’. Use the Basic View when adding one or more simple conditions. Use the Advanced view for nested or compound conditions. – If you select “Question” as your Source Type, the Source drop-down will populate with all questions preceding this survey item. You can set conditions based on questions from the same page or a previous page. 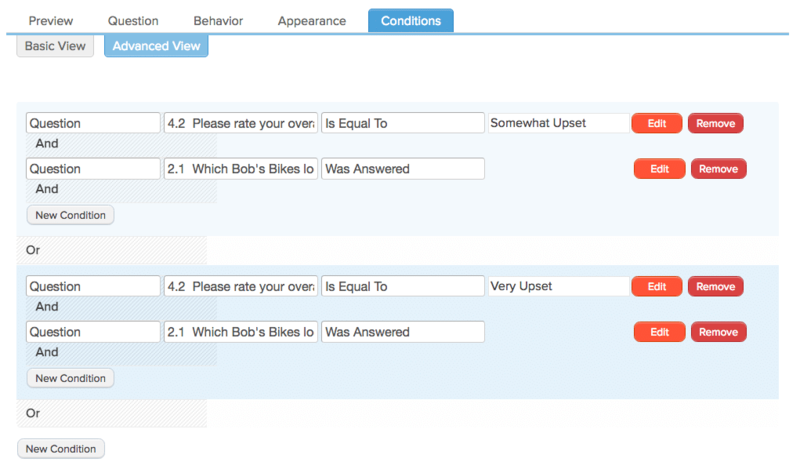 For example, you might ask a customer to rate their satisfaction level from 1-5 in question 1 and then ask a follow-up question such as “Why weren’t you satisfied?” In this example, you might add a condition to question 2 so that it only displays when the answer to question 1 is less than or equal to “2”. – If “User Attribute” is selected as your Source Type, the Source drop-down will populate with user attribute labels. In order to base a condition on a user attribute, the respondent must be logged in as a registered user of Checkbox. For instance, you might store a user’s department in their user profile and then set a condition to only show to users in the “Marketing” department. – If “Response Property” is selected as your Source Type, the Source drop-down will populate with a list of response properties. For example, you might set a question or message to display based on the score of the survey. In this case, you could set the condition so that the question or message displays if the Response Property Total Survey Score is greater than or equal to “x”. Select/enter the Value. Depending on the comparison you selected, the Value field may appear as a drop-down, text field, or may not appear at all. If you select “Question” as your Source Type, a drop-down list will populate with the answer options for the question you selected as your Source. For open-ended questions, a text field will appear so you can type in free text. Select ‘Add’ to add you condition. To add more conditions, click the New Condition button. If you add more than one condition, check to make sure you have the correct radio button selected for “Any” or “All”. “Any” means that only one condition has to be true in order for the item to be displayed. “All” means that all conditions must be true in order for the condition to be displayed. To add conditions to a survey page, click on the Conditions link, located to the right of the Branching link beneath your survey page number. Create your condition using the steps outlined above. When the condition(s) are met, the entire page will be shown. Otherwise, the entire page will be hidden/skipped. 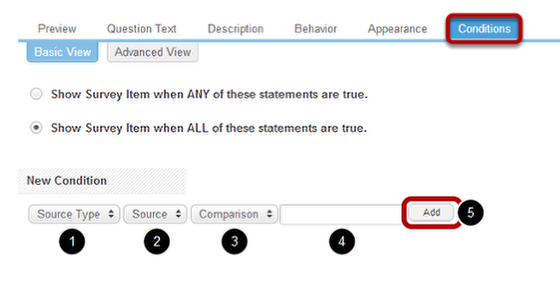 Nested conditions mean that you want and item/page to be displayed when [A AND B] AND/OR [B AND C] are true. If either of these sets of conditions is met, the item will be displayed to the respondent. To add a branching rule to a survey page, click on the ‘Branching’ link, located to the left of the ‘Conditions’ link beneath your survey page number. NOTE: You always want to add the branch to the page you are branching FROM. Also note that you can only branch to an entire page, not to a specific question on a page. If you want to show/hide specific questions, you will want to follow the instructions above for adding conditions to your questions. Next, select the page you wish to branch a respondent TO. The “Go to page” drop-down contains all pages after the current page, including the Completion page. Branching to the Completion page will end the survey for the respondent. Then, select the New Condition button to create the condition(s) or rule(s) under which you want the branching to occur. Select the Source. If you select “Question” as your Source Type, the Source drop-down will populate with all questions preceding this survey item. If “User Attribute” is selected as your Source Type, the Source drop-down will populate with user attribute labels. If “Response Property” is selected as your Source Type, the Source drop-down will populate with a list of response properties. Select/enter Value. Depending on the comparison you selected, the Value filed may appear as a drop-down, text field, or may not appear at all. Select ‘Add’ to add your branching rule.